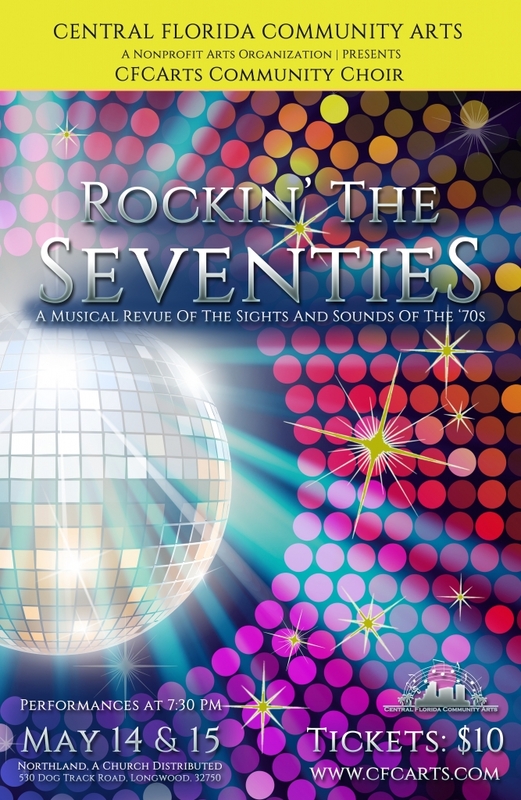 Get out your leisure suit, bell bottoms and platform shoes because Central Florida Community Arts proudly presents Rockin’ the Seventies, as performed by our CFCArts Community Choir and Symphony Orchestra. The 1970s were filled with turbulence and new technology in the midst of a unique culture. These were the days of pet rocks, mood rings and water beds, when we could listen to 8-track tapes in our cars, instead of just AM radio. Disco was king, while electronic music and hip hop got their start in what is sometimes referred to as the “me” decade. Find your inner disco diva and join us as we perform a musical revue of the sights and sounds of the seventies, with songs from ABBA, Michael Jackson, the Bee Gees and more! Rockin’ the Seventies will be held at Northland Church at 7:30pm on Thursday, May 14 and Friday, May 15. General Admission tickets are $10 each, Priority Seating tickets are $25 each and children age 3 and under will be admitted for free.